Karachi: Pakistan’s iconic music platform, Coke Studio is all set to launch its Season 10 in early August, setting a unique milestone for continuity, innovation and popularity over 10 consecutive years. This important milestone resonates intrinsically with the country’s celebration this year of its landmark 70th anniversary of independence. In the past decade, Coke Studio has featured scores of singers, musicians, instrumentalists, music producers, while showcasing the talents of music industry professionals like sound and recording specialists, set designers, wardrobe specialists, and numerous others. For the people of Pakistan, especially the youth, it has been a source of great inspiration, pride and identity. Coke Studio has projected a more positive image and a softer side of Pakistan internationally, with the fan base of Coke Studio spanning to over 150 countries, and with at least 20 countries starting their own version of Coke Studio. Moreover, it has helped reignite the music industry of Pakistan with ever-increasing resources and platforms mushrooming over the last decade. Over the years, Coke Studio has also served as a platform for rising newcomers to perform alongside established artists and legends in the music world, turning lesser known names into household ones. 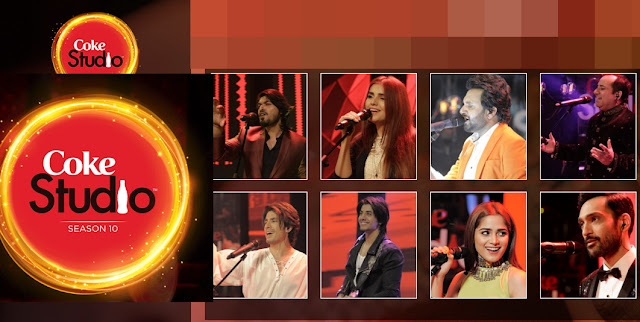 Coke Studio Season 10 will feature more such new talent alongside some of the biggest names in Pakistani music. Among these younger performers are the children of some of the country’s leading singers performing with their fathers, bearing forward the heritage and legacy of their parents. As Coke Studio celebrates its 10th anniversary, it can look back proudly to the difference it has made, not only for the featured performers but also for the house band, individual musicians, technical support specialists and many others. Fans of Coke Studio, the Sound of the Nation, can look forward to this Season as one which they will remember with great nostalgia and fondness for many years to come.